I will cast back in memory until it fails me, or until I reach the date of my last blog, whichever comes first. 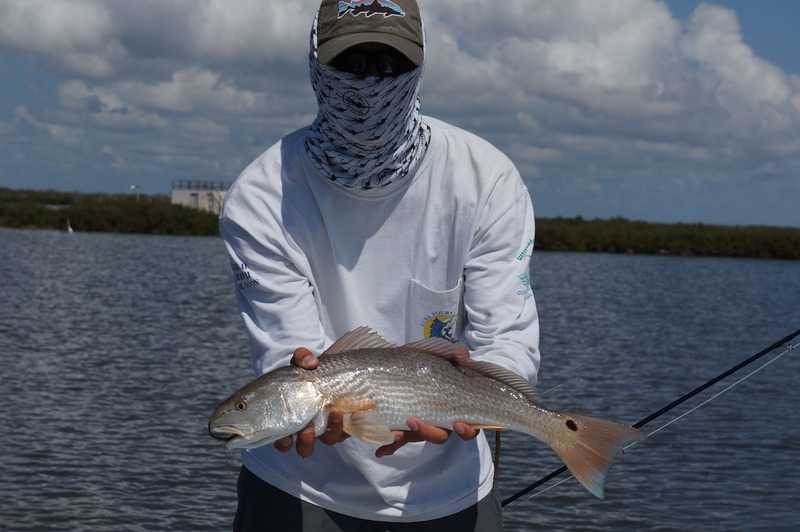 On Friday, and again on Sunday, I guided brothers Clay and Chuck Armstrong, who had flyfished in coldwater venues, but had never caught a redfish on a fly. 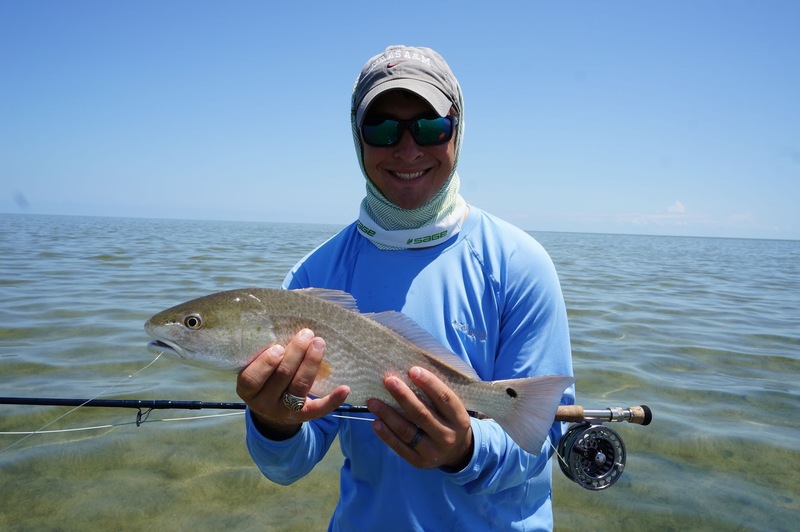 Short, precise casts are what you need in a small stream with overhangs, but when it comes to saltwater sightcasting, you need a long, precise cast. Even a long cast isn’t enough, because as you will find you may get one or two casts to a tailing pod of reds, and then they will sense your presence and break up. As if to reward the guys’ willingness to practice in near-impossible conditions, momma nature drummed up a bit of wind so that when we arrived at our second venue and found pods of tailing reds mixed with hardheads, we were able to get within 100 feet of them. There Clay landed his first red on a fly, and Chuck missed one than ran toward him before spitting the fly. Later, on the sand under a cloudless sky, they got shots at scattered reds; and both brothers managed to land reds on small Clousers. 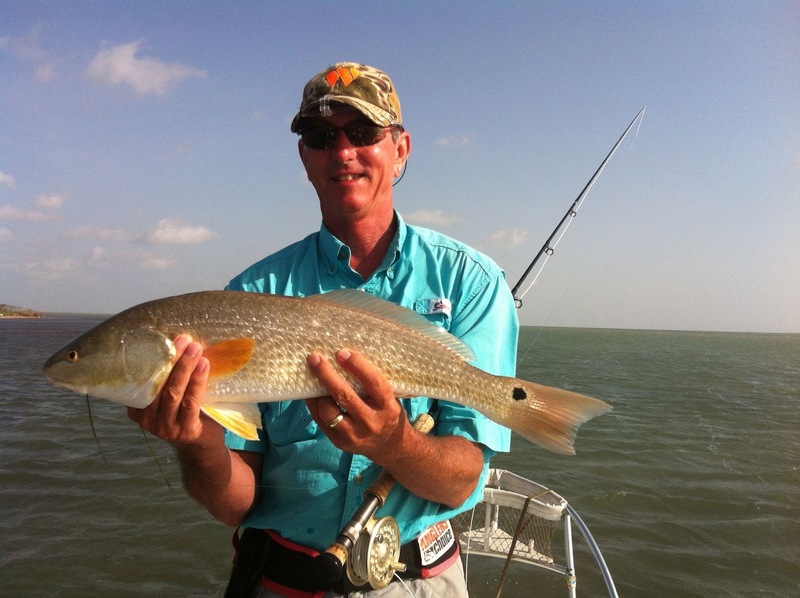 Indeed, Chuck’s first red on a fly was an especially impressive feat. He and I were walking downwind when I decided to go back and float the Stilt down to where the guys were. Turning around, I spotted a half-dozen reds feeding behind a sting ray, moving slowly toward us. Without thinking about how nearly impossible it would be to cast a fly upwind with his back cast, Chuck dropped the fly in the middle of the “cartwheel” of reds around the ray, and they fought over it. I will never forget that catch; and of course, neither will Chuck. In between guiding the Armstrong brothers, Julie and I took Rosie and went out for one of our memorable afternoon excursions onto the sand. This time, Julie took along a beach umbrella and chair, looking forward to setting it up next to the Stilt in the clear water of the easternmost LLM, and reading while I flyfished. As usual, I planed slowly over several miles of fishless water, looking for enough reds to justify shutting down. Growing impatient, Julie finally turned around and said, "Are we going to run around all day?" So I shut down, and set up Julie's umbrella and chair, fully expecting to encounter not a single redfish on my wade. Rosie joined me, as always, taking up a position just behind me. For the first 30 minutes, I didn't see a single fish, even though I could literally see 100 yards downwind in the perfect sight casting conditions: There was a moderate wind to break the surface tension of the water, and not a cloud in the sky. But suddenly, I spotted the first redfish coming upwind and feeding head down. I casted to him, and spooked him. I thought that he was probably the only fish within a mile radius, but soon after missing that fish, I began spotting one red after another until it was almost constant action. I landed three fine reds from 23-24 inches, and then headed back. I don't have to catch many fish any more before I'm happy and want to leave them alone. Let me see: Going back a bit further, I had the pleasure of guiding Doug and Steve Gauntt from Dallas. The Gauntt brothers have probably caught more reds per day than any other regular flyfishing clients, having caught over 45 on one memorable day, and well over 20 reds per day on several different days. No wonder they keep coming back. But except for our first day, we had tough fly fishing. On the first day, they landed around 15 reds and a nice trout, mostly on the sand. After that, it was single digit days. Windy and cloudy conditions keep the Gauntts from doing their usual thing. Alas, every fine angler meets his match from time to time, and when it comes to saltwater flyfishing, that happens with regularity. The great days keep us coming back, and the bad days keep us learning. The three days before the Gauntts came down, I guided my old client Jack Miller from Arizona, along with Roger and Greg––two of Jack’s buddies from the Arizona Fly Casters. I had guided Jack on two previous occasions with his old friend Dario, who has since passed on. 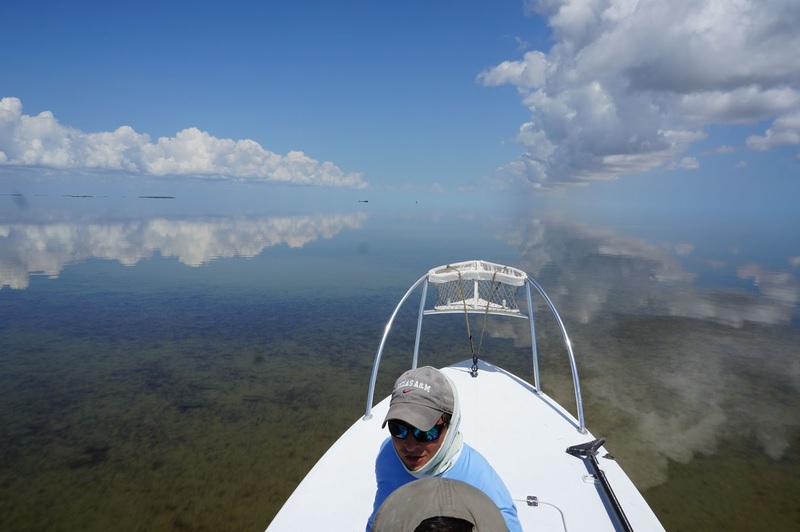 Jack and Dario had enjoyed some of the best flyfishing conditions on the LLM imaginable. But this time, the fishing was not so easy, mainly because we faced unstable, cloudy weather for two of the three days. I think it was the second day when we were run off the water by a storm approaching from the Gulf. After taking the guys in at midday, I began to feel badly that they were just sitting, unable to fish. So after the weather cleared, I called them and suggested we go back out and check out the far east side action that I’d been enjoying (see earlier entries). The guys enthusiastically agreed that a late afternoon foray onto the sand would be a welcome antidote to an otherwise lackluster day. We headed out a bit too early for the sand action, so I headed for a westside lagoon that just might have some birding action. Even in August, birding can be “on,” especially in the late afternoon, if you know where to go. I drove into the area, and couldn’t see much gazing into the low sun, but suddenly, there they were: gulls working low to the water. Looking beyond them, we could see several groups of birds hovering and dipping over large pods of reds. As I poled into the lagoon, it became clear that we stumbled upon a veritable convention of redfish. Gathering as they often do once the boats are off the water, and they have full sway of the back lagoons, the redfish were all around us, sweeping under birds, and driving waves that you could surf on. It was very exciting for the guys. But the bottom was very soft, and there were three anglers on the skiff. It was going to be a juggling act to get everyone on fish before the evening was over. Greg opted to wade, even though the conditions were as close to impossible as you will find on the entire LLM. The high point of the day was when Roger was on the bow, and Jack was casting from a seated position behind the console, and I waded alongside the boat, and turned it at the last minute so both anglers could cast to a tailing pod. 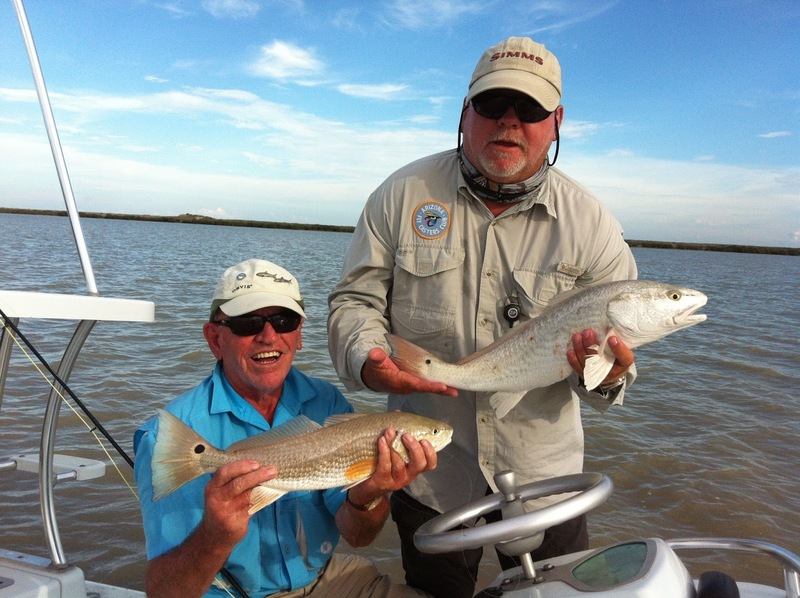 Both Jack and Roger hooked up and landed reds. Here’s a shot of them with their reds before we released them. Enough for now. As we go into September, I look forward to fishing some areas that are normally too shallow through the summer. Already, I am finding abundant pods in areas just deep enough to host reds feeding on maturing white shrimp. It’s going to a great fall, I can tell––very similar to last year. Come on down and fish with us!